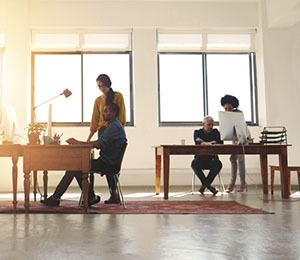 Open-plan offices are becoming ever more popular in the workplace but according to a study done by the Acoustical Society of America, work-related conversations employees overhear can lead to a decline in performance of cognitive tasks that involve memory and arithmetic. In a study led by Takahiro Tamesue, associate professor at Yamaguchi University in Japan, researchers aimed to take a look at how meaningless and meaningful noises affect a person’s selective attention and cognitive attention, as well as how annoying they find these noises. Subjects’ brainwaves were measured during a test they call the ‘odd-ball paradigm’. “In the odd-ball paradigm, subjects detect and count rare target events embedded in a series of repetitive events. To complete the odd-ball task it is necessary to regulate attention to a stimulus," explained Tamesue to Science Daily. “[His] laboratory focuses on improving auditory environments by analysing the physiological and psychological effects of noise,” they added. For this experiment they used a visual and auditory odd-ball paradigm. In the former, volunteers were asked the number of times certain images appeared on screen while listening to “a pseudo voice-noise consisting of a pink noise with a spectrum closely resembling that of speech [and] male and female speech”. In the latter, they were made to detect a 2,000-Hertz tone in a series of 1,000-Hertz tones and asked their level of annoyance at each sound. In addition to a decline in performance, they also found that the degree of the meaningfulness of the noises, such as music and conversation, greatly affected their selective attention and was most pronounced during the auditory odd-ball paradigm test. “The experiments suggest that when designing sound environments in spaces used for cognitive tasks – such as the workplace or schools – it is appropriate to consider not only the sound level, but also meaningfulness of the noise that is likely to be present,” Tamesue said. “Surrounding conversations often disturb the business operations conducted in such open offices. Because it is difficult to soundproof an open office, a way to mask meaningful speech with some other sound would be of great benefit for achieving a comfortable sound environment,” he added.